After Prophet John received the little book and ate it, as we examined in the last article, the angel instructing him immediately directed his attention to the work of “two witnesses”- two prophets who will be sent to prophesy during the second half of the Apocalypse week of years. These two people are doorkeepers for those who will make the pilgrimage to appear before the LORD at Zion. Hence, the last chapter concerning a messenger with a little scroll, standing on earth and seas, is directly connected with the two witnesses’ works of unification for two peoples. 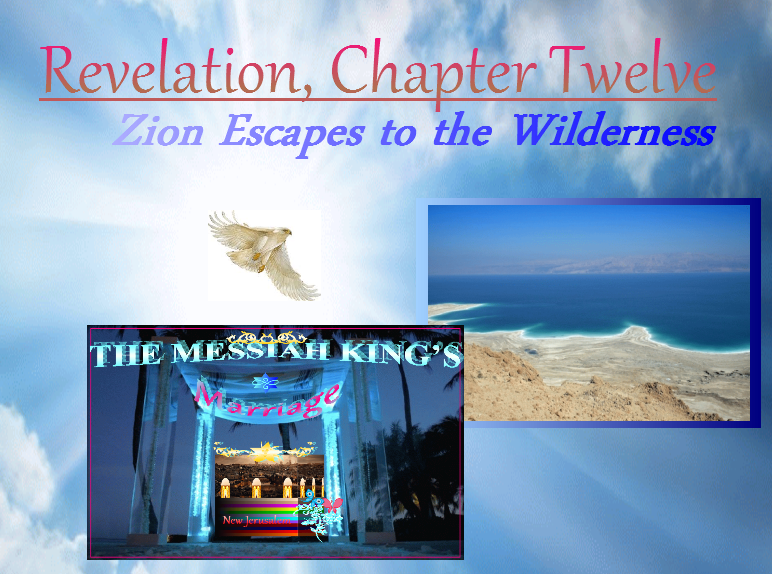 Although the tents of the wicked- the temporary opposition to the Kingdom by the people of the Antichrist- will be spread about Jerusalem during the “time of Jacob’s troubles” to resist them and the coming Kingdom of Messiah, they will lead the true “Bride” (citizens in covenant) of the Great King, to a place to wait in the wilderness for the completion of the signs- the fulfillment of Sukkot, the Feast of Tabernacles. These two concierges to the coming Kingdom are Moses and Elijah, and they will be known during the time because the things that they prophesy to the world will come to pass. When the Antichrist (a.k.a. the Son of Perdition, Apollyon) is revealed in the middle of the appointed seven years, c. 2026 A.D./C.E., these two witnesses (also called “two candlesticks” of the Menorah and “two anointed ones” shedding Divine light) will begin prophesying. The prophetic key to the above passage is that the collective elect- the “man”– will prefer a day of God (a millennial day) to dwell with the King Messiah- their Protector and Sun of Righteousness– than the temporary days of man. 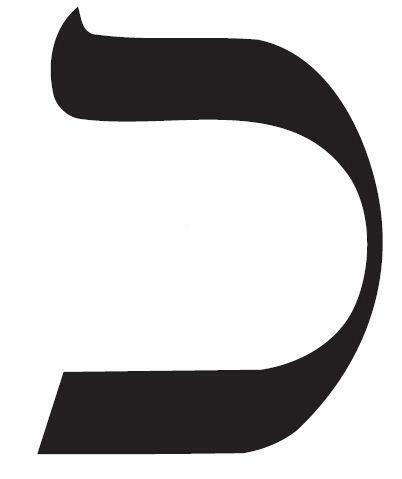 Again, we perceive the Aleph Key subtly given for those who are called and chosen to reign with the Lord Messiah. As already written, the Temple Mount (place of God’s House, Har haBayith) in Jerusalem will be the center of international controversy before the Messiah comes. Indeed, it is already a source of conflicting global interests. For readers who may not already know, currently the Dome of the Rock, built to honor the False Prophet Mohammad (692 C.E. ), sits where the Temple of God stood for the most part of a millennium (before 70 A.D.), but the Temple will be built there again. Inside the dome is a rock slab in which many Muslims falsely claim Abraham was about to sacrifice his son Ishmael on- not Isaac as written in Scripture (others claim Mecca and cities of Saudi Arabia as the place). 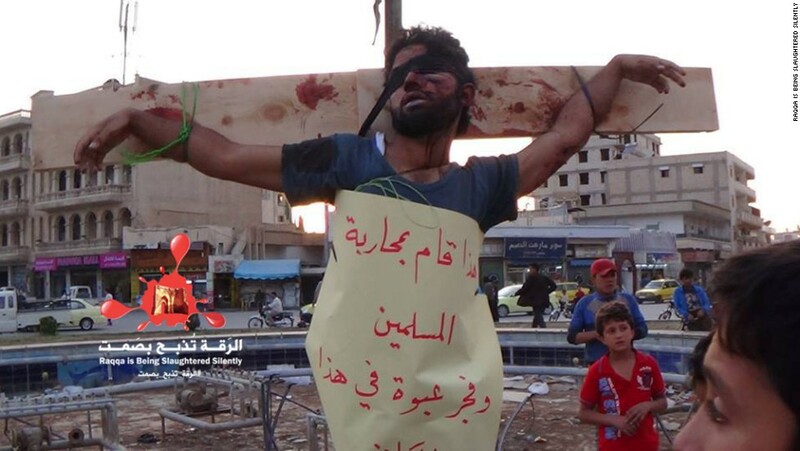 Just as Islamists take Jesus down from the cross and place Judas Iscariot there, they also take the promised son Isaac from the place of his figurative sacrifice on Mount Moriah, and they install the disinherited son, Ishmael. In the Book of Ezekiel, it is clear that the Temple will be rebuilt at its place for the Sabbath millennium; yet the dome, where the False Prophet is believed by Muslims to have ridden his black steed into heaven, sits in the Temple area today, along with supporting mosque and its structures. It sits as an abomination on the Temple Mount and has been since the 8th century. Again, Satan seeks to mirror the prophecies by his own power, such as Ishmael replacing Isaac, but the true Temple will be completed during the 7th millennium (the Great Sabbath). Moreover, the Temple Mount is a place of contention and spiritual warfare that involves approximately four billion people in the world today (Jews, Christians, and Muslims). Thus, Jerusalem and the Temple Mount will be an even greater place of contention and controversies during the final war of the age. In 1967, in the Six Day War (appropriately called for the sixth millennial day), Israel, under attack from surrounding Muslim nations, recaptured Jerusalem from Jordan. Yet the Israelis left the Temple Mount under Muslim, Palestinian Authority rather than destroying the abomination and forbidding the children of the False Prophet to ascend. And, regrettably, they left Muslims in control of the ancient, eastern half of the Holy City. Only the Western Wall, known as the Wailing Wall, and the Mugrabi Bridge were left for the people of God. 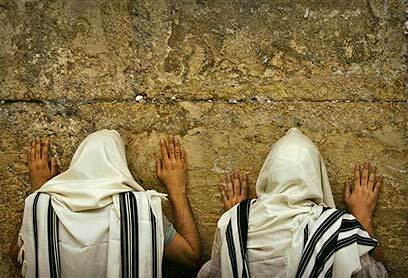 Today, at the famous wall of the ancient Temple, mostly Orthodox Jews and devout Christians (along with visiting foreign diplomats) put prayers in the cracks of its huge stones, many mourning and groping sadly. And, likely, many of the prayers are for its restoration, considering that knowledgeable Jews and Christians heed the biblical prophecies of its reconstruction and await a day when the entire Temple Mount will be “given to the saints of the Most High.” However, only Muslims regularly ascend its hill for their Friday (6th day) services, soccer, picnics, prayers, and the like on Temple grounds. And, as should be expected from Islam, Palestinians have utilized the Temple Mount for terroristic assaults on Christians and Jews who are (during peaceful times) allowed to visit (i.e., under heavy scrutiny of the P.A. and accommodating Israeli police, with prayers and Bibles strictly forbidden for non-Muslims). For many Orthodox Jews, it is only when the great Temple is rebuilt that the holy days (moedim) can be properly conducted by the kohenim (priesthood), to give atonement for national sins. Yet the progressives of the world, and all who do evil, seek to prevent God’s will for the Israeli nation and Temple, seeking to make an independent state for Palestinians with Jerusalem as their capital. Even the Roman Catholic head, Jorge Mario Bergoglio, has resisted God’s will and Spirit and given his support for the Palestinian plight before the United Nations. The Lord YHVH has looked down and seen the faithful among Christians and Jews, and He offers a greater atonement that will accompany the reconstruction of the physical Temple. When Jews nationally begin to mourn for the sacrificed Lamb, Yeshua, not merely for the Temple that was put in place for foreshadowing sacrifices, then the Creator will act. 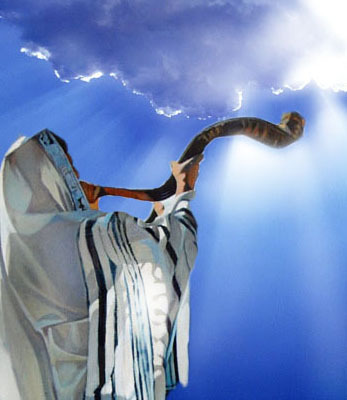 Often religious Jews preach of things that Jews can do to hasten the coming of their awaited Moshiach, but they can hasten nothing without acknowledging the Messiah Yeshua. The Lord YHVH is the Redeemer, and the Temple that will be rebuilt only foreshadows Him and His work of salvation and redemption through Christ. Blindness on the part of Israel must first be removed, and they must learn the full meaning of Torah, then Messiah will come. The controversy over Mt. Zion will continue until the dome of the False Prophet is obliterated with enemies of Israel destroyed at the return of Messiah. Recently (not historically), Muslims have created the myth that the Temple Mount is one of their three holiest shrines (after Mecca and Medina), though Mohammad wrote nothing of Jerusalem in the Quran, and he considered Mecca alone a holy place for his false deity, Allah. Nonetheless, the controversy and their lies will end when Messiah comes. 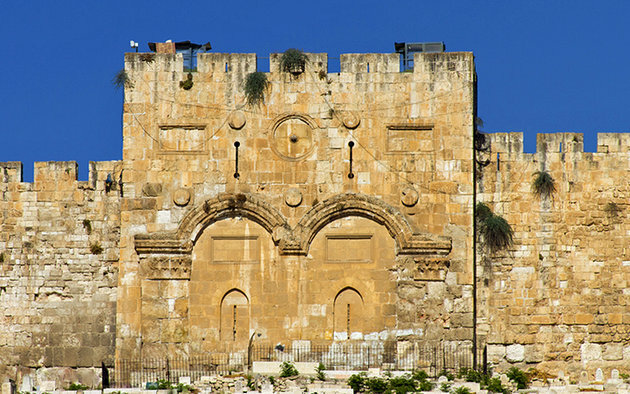 Christ is prophesied to come through the Eastern Gate (Golden Gate), which is currently sealed-up with a Muslim graveyard before it, and then finish His glorious Temple. Muslims sealed the Eastern Gate and planted a desecrating graveyard for their dead to prevent messianic prophecies from being fulfilled. Christ, however will not regard the customs or concerns of the children of the False Prophet Mohammad, and He will tread as He so desires to His Temple Mount. Howbeit, that death put before His entrance might actually hinder Him? In fact, the sealed gate only fulfills prophetic Scriptures of the entrance being shut-up except for the coming High Priest and King. Sealing stones at the door in the appointed place of His throne cannot postpone Him. The angel instructing John in Revelation directly ties measuring of the Temple for reconstruction into the prophesying of Moses and Elijah. Some might postulate that the passage concerns the spiritual Temple, since we are people of many nations who are not numbered before God’s throne (when the twelve tribes are measured), for the Court of the Gentiles is not measured in the passage. Yet we know that Gentiles cannot tread a holy, spiritual Jerusalem underfoot for 3.5 years, so the passage must confess a corporeal place. The outer court of the Temple will be tread underfoot by Muslims and when the Antichrist and his flood of troops descend upon Jerusalem and place their tents between the seas and on the glorious holy mountain. The spiritual city of Jerusalem that descends, whom anointed believers are collectively, does not have a Temple, for the people are the Temple of God’s Holy Spirit (Ruach HaKodesh); but the physical city- shadow of the substance- was foretold to have the Temple rebuilt. The physical Temple will be under construction before the return of Messiah, and the Antichrist will blaspheme from there. Is this not the ultimate abomination that causes the desolation of opposing nations, even greater than the abomination of the dome of the False Prophet, seeing that the Antichrist will sit in the Temple during its construction period and claim that he is God? Halfway into the Apocalypse week, the Antichrist will be enraged against the people of God and come in with a flood of troops. The people who know the prophecies will flee east into the wilderness, but many will remain and to be taken captive. The Antichrist (A.K.A., the Beast) will blaspheme the Lord YHVH and attempt to change the prophecies of Scripture, the appointed times, and to alter the Divine Laws. During this time, Moses and Elijah will be revealed in sackcloth and prophesy against the Beast and the antichristian nations of the world. They will also teach the elect who escape into the wilderness. Yet as in the days of Moses, when Pharaoh increased the afflictions on Israel, and as in the days of Elijah, when Jezebel continued to kill the prophets, the Lord GOD will allow the Beast power to persecute the people until the cup of his abominations overflows and the vials of wrath from God are visited upon him. For those who are able hear beyond the afflictions, Moses and Elijah will share the light of revelations from God and the anointing oil of His Word and Spirit. The description of the two olive trees and the two lampstands was first foreshadowed in the offices of Joshua (Yehoshua) and Zerubbabel- the high priest and governor who led the Lord’s people home when the seventy years of Babylonian captivity was complete. At the appointed time, they led the scattered people out of Babylon and back to the Promised Land to rebuild Jerusalem and the Temple. Together they showed how the priesthood and the governor would be joined into one office; the Spirit of Prophecy and the Law of the Letter would be united for revealing “the Branch”- the Messiah who comes to reign as both High Priest and King during the Great Sabbath. In previous articles I, the scribe, explained who the seven Revelation lampstands and stars of the assemblies are; in this chapter we find the two prominent messengers declaring the Messiah- the central Branch of the Holy Menorah. Yet there is more to the two olive trees depicted in Zechariah, for they also prefigured the joining of two peoples, of Jews and Gentile believers of the covenant, even as Paul described two olive trees joined into one (see Romans 11). Zerubbabel, whose name means born in Babylon, would be joined with Yehoshua, a name of Hebrew origin meaning salvation, to show how the Gentile believers in Christ are joined with the salvation promised to the Hebrew faithful. Elijah was taught that power alone does not reveal the Lord or convince the Hebrews to remain faithful to Him. In revealing the Lord, he had to do so by the Spirit. By the Spirit, Elijah will bring down today’s Babylon and reveal the Capstone of the faith: the Messiah. Every mountain that exalts himself against the Lord and His people will be brought low; every humble valley among the people will be exalted; the crooked people with crooked doctrines will be set straight, and the way of the Lord will be prepared by the Spirit. The Stone of stumbling is lifted up and no longer stumbled over, and the prophecies are made plain and smooth for the people of God. Then the Stone is revealed as the Capstone of the faith, sealing-up and finishing the Divine prophecies. This comes from the gentle voice of the Spirit. Elijah was very zealous for the LORD when the children of Israel had forsaken the covenant, torn down the altars, and killed the prophets (see 1 Kin. 19:10), but the Lord showed him that God was not revealed in strong winds that tore into the mountain, nor an earthquake nor fire, but by the “still, small voice” of the Spirit. 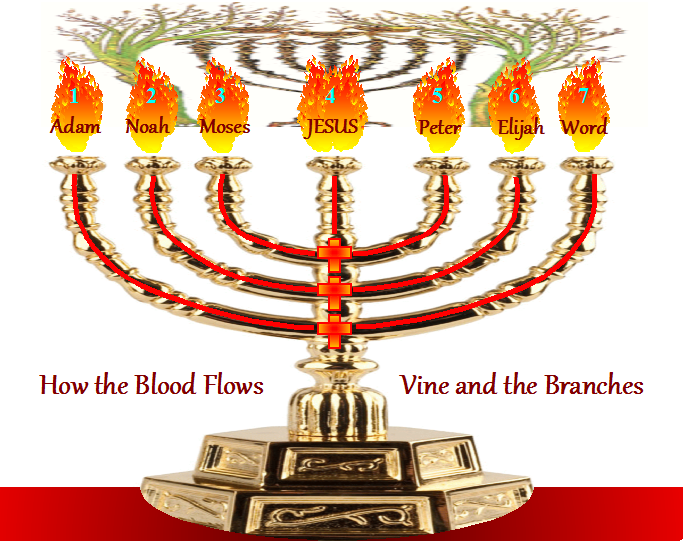 The Menorah of seven candle branches, as noted earlier in this writing, represents the enlightenment of the Holy Spirit of God. The seven Eyes that go to and from the earth are the vision of the Spirit of God. The Spirit rejoiced to see the Temple foundation restored by Zerubbabel, and the Holy Spirit rejoiced to see the measuring line in Zerubabbel’s hand. The same Spirit connects this foreshadowing with the witnessing of Moses and Elijah in Revelation, as the new Temple is under construction, with all the spiritual stones and measurements correlating to Messiah revealed. Moses wrote the letters of the Law, given in the shadows with hidden messianic meanings, and Elijah is appointed to turn back hearts by calling all of Israel to “remember the Law of Moses” (see Mal. 4). Together, they reveal the doorway of the coming Kingdom. When Moses and Elijah reveal the foundation and the measurements, the Hebrew people will know that the Messiah was sent to them. The anointing of Elijah and Moses will give the light of revelations for restoration and completion of the spiritual Temple, revealing the Capstone of the faith. They give their anointing oil like two olive trees for Jews and Gentiles, giving the light of revelations of Messiah to the entire seven-day Temple of Wisdom. When the olives are pressed for oil during persecution, the light of God shines forth. Consider the spiritual Temple of “living stones” (see 1 Pet. 2:5) which is built upon the foundation of Christ and Christ sacrificed. From whence did the first “living stones” come- the stones who followed Messiah’s ministry and Gospel? Andrew and another disciple first came from John (see John 1:41). John, with the prophet’s spirit, was the great harbinger of the New Covenant predicted by Prophet Jeremiah, even as Moses brought the Old Covenant and its measurements and foundation. Elijah, if you are able to receive that John the Baptist was him, announced the “Lamb of God who takes away the sins of the world,” even as Moses called for the first lambs of Pesach and revealed the Father (Abba Elohim YHVH) as Israel’s Redeemer. As for the plummet-stone, a measuring line of the Spirit, it was also used to measure the depths of water in deep wells, which were often too dark for people to determine surface levels. The stone was lowered down into a well, into the water on a string, and the wet measuring line witnessed to the depths of the water after the stone was raised. These are the deep sayings of the waters of the Word, which were at one time too dark to perceive. Yet the Stone of the Spirit- our Messiah- has descended into the deep waters of the Word and was raised from the depths so that the mysterious measurements of Scripture may be perceived by the evidences of the waters of the Word. Measurements of Scripture are perceivable when we base all the moedim on their fulfillment in Messiah, and the Holy Spirit rejoices to see these measurements revealed unto you. In other words, God leaves us measurements of time that assist us in uniting the stones of the living Temple for the coming Capstone. The term canon, for combined books of Scripture, was derived from the ancient architectural usage of measuring reeds, and figuratively, the reed/cane is moved by the winds of the Holy Spirit, measuring the Word. “What did you go out into the wilderness to see? 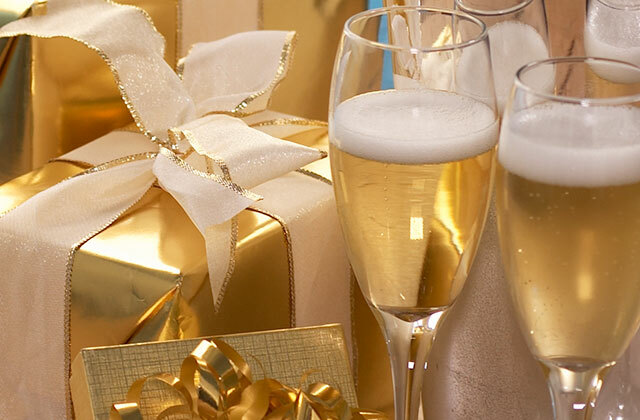 A reed shaken by the wind?” Messiah asked. “He was the burning and shining lamp, and you were willing for a time to rejoice in his light.” From this passage we are able to discern that the measuring seen in Revelation, involving the two witnesses, need not apply only to the physical Temple. It also alludes to them bringing timely comprehension to the Body of Christ. Zerubbabel foreshadowed the work of the messenger of the Lord in measuring the spiritual Temple, leading us to Moses and Elijah. The gist of this isspiritual enlightenment associating the two messengers with timely measurements, which both the olive tree of Israel and the olive tree of Christianity will discern for the unification of one spiritual Temple awaiting the Messiah. The mystery of the Ekklesia– the called-out anointed ones- was hidden in past ages, and even today Bible-believer disagree on the identity of the two anointed ones, but by properly measurements of the Word we find that they are Moses and Elijah and collectively the New and Old Covenant peoples (when joined). The golden Menorah that the prophet saw had its place in the Holy Place of the Temple, shining light on the 12 loaves of showbread. 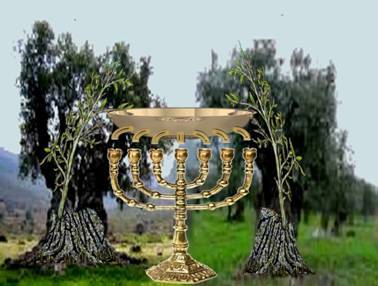 The two olive trees dripping oil into the Menorah, which in return gives light, shows that Moses and Elijah, by their anointing, will shine the light of revelation (the enlightenment of the Holy Spirit) on the 12 restored tribes- the global showbread of God that is divided into the two peoples of Judah and Israel. By the oil of their anointing, others will be able to see the exalted people of Scripture (the Bread by the candlestick messengers of the Spirit). This is the oil that does not fail, and this is the anointing that multiplies the Bread of God’s Word by Ruach HaKodesh. The theme of two witnesses at the right and left hands of the LORD has several types in Scripture. When the Lord came to the tent of Abraham, when Abraham humbled himself and washed His feet and fed Him (see Gen. 18:4-5), the two men/angels with Him (see Gen. 18:2; 19:1) were sent to call out the righteous before the cities of Sodom and Gomorrah were burned-up. The throne of God (Mercy Seat) in the Holy of Holies in the Temple had two angels, one on each side of the Lord YHVH’s seat; they had their wings stretched out over the special, hidden things of God in the Ark of the Covenant. 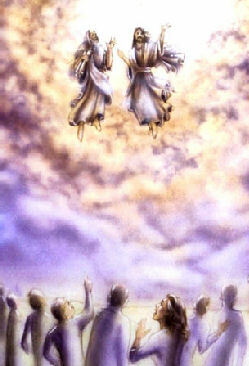 In Heaven there are two archangels given predominance over the Lord’s work- Michael and Gabriel. When the Messiah ascended the Mount of Transfiguration after six days, Moses and Elijah appeared there with Him. Together they show the justice of God, with salvation for the righteous, and destruction for the non-repentant who deny and hate the Lord and His testimonies. It is not that one hand is evil while the other is good; it is that those who deny the hand of grace and salvation are given to the hand of judgment by the everlasting Law of righteousness. The scales of righteousness are not tilted in any injustice but are upheld by the two who send forth His Spirit. Both hands of Moses had to be upheld during battle for the people of the Lord, salvation to the trusting people and destruction to the persecuting people. The water of the Word was rightly divided for the salvation of one people and it came down as a curse for destruction on the other. So in the two witnesses we see a balance between Law and Grace. There are four people of Scripture whom the Lord God showed to rightly divide the waters of the Word. Moses, Joshua, and Elijah are the three most known, and Joshua (as already explained) foreshadowed the Messiah Yeshua. But who was the last? Elisha was, the great and honorable prophet. He was a servant of the Lord, faithful to follow when asked and to lead when asked to lead. Scriptures are incomplete without him. 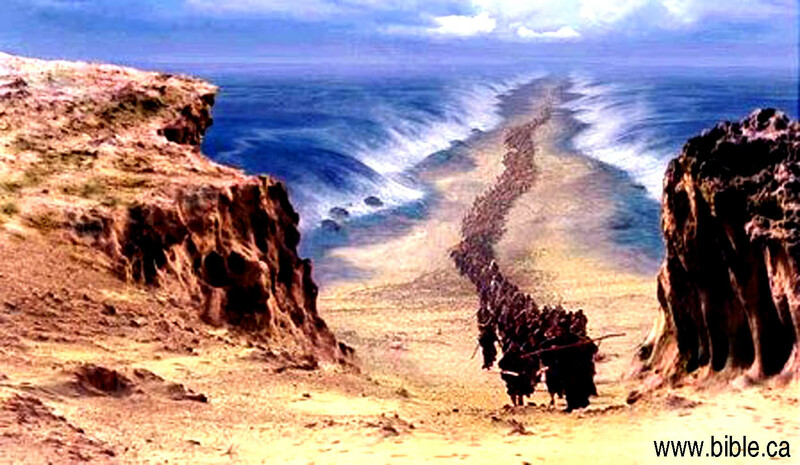 So Moses, giver of the Law, who divided the Reed Sea, turned over his leadership to Yehoshua, who divided the Jordan River for Israel’s passing over into the Promised Land. And Elijah, the restorer of the Israel, who parted the water, turned over his work to his student Elisha, who took up his mantle and rightly parted the water. And what do these things means except that all things will be rightly divided and turned over Christ and those who pick-up the mantle to enter the coming Kingdom with Him? How does Elisha fit into the big picture? Elisha did many miracles, standing for justice and zealous for the Lord. Now this is what I am saying: Believers who will take the mantle of Elijah in these last days will receive a second portion of the Lord’s Spirit, doing great things to prepare for the coming of the Messiah. The work of Moses and Elijah are nothing without the people whom the Lord YHVH is forming for His glory. The whole Temple of the Spirit is to be fit together as one, with the stones supporting each other. The Spirit passes to spirit, and in my estimation there is a last-day Elisha army of God’s arising, whom the Lord will bless with great understanding and power to do good. They will wield the sword of God’s Word to defeat the Adversary at the return of the King. The world’s work can be summarized as self-righteousness, pride, refusal of the truths of the Law and/or Grace, refusal to be humbled, refusal to honor God’s works, refusal to accept another as sinless and acceptable for them, jealousy, rebellion, maliciousness towards righteousness, self and not God, self-justification, denial of the Spirit, denial to the demand of repentance, disregard for the Word, insulting the prophets, and hatred for the Son of God who was sent in the name and Spirit of God to provide redemption for us all- though we all have fallen short of the glory of God and His laws. They are in the churches and synagogues, in the mosques and in secular politics; they have two things in common- hatred for biblical truths and love for their own lies. They are progressives and self-serving globalists, sympathizers with darkness, ignorance, evils, and ceaseless perversions. They hate Israel, and they hate biblical Christianity. And God raises His army of Elisha to battle them with all truths, with knowledge and wisdom and discernment of His mysteries. As for how Moses and Elijah prophesy to the world, it will not be with a still, small voice; it will be in the form which the world is able to comprehend, having denied God and His means of redemption by the Spirit of Truth. Many have chosen to have the spirit of the world, and it is unfortunate for them that their time of rebellion and lawlessness draws to a close. The world still belongs to the Lord YHVH, and He will not waver from fulfilling His Word. If He were to reveal Himself to them in His glorious Spirit, their souls would be ignited in self-loathing, with no atonement by grace through the blood of the Messiah. But they refuse to be humbled under the Right Hand of grace and salvation, and are in their pride given to the left hand of judgments under the everlasting spiritual Law of my God. Fire coming from their mouths means that they will prophesy by the Spirit. Our God is an all-consuming fire against His enemies. Elijah spoke the word when captains of fifty were sent against him to take him, and fire came from heaven and devoured them (see 2 Kin. 1:9-12). The rain only came by his word when the heavens were stopped for three and a half years. By Moses’ word the waters of the Nile River were turned to blood, and by his word all the foreshadowing, apocalyptic plagues struck Egypt. Moses and Elijah battled false prophets and sorcerers of false gods by the words that the Lord gave them. When they sound their trumpet warnings, as they are sounded in Heaven, the wrath of the Lord will be poured out upon His enemies. The people of the world will refuse the waters from Heaven, the waters of Shiloh that flows softly, so the waters will be stopped. But when they do drink, the waters will be filled with blood, even as the blood of Christ’s sacrifice in which they refused, for the waters will confess the blood. Moses and Elijah will bring them comprehension of the foreshadowing signs in which they have refused to acknowledge and will resist in their blasphemies. Spiritually, during the Apocalypse, Jerusalem is likened to Sodom and Egypt, because the people of the Lord had to escape in both of those places. In each case two men of God were sent in to lead the faithful elect out and into the wilderness. Jerusalem, at this time, will be overrun with Gentile forces united with Muslim terrorists and the Beast. And the nations of the world will consider the two witnesses enemies because of their prophecies that come to pass, even as Moses and Aaron were considered enemies to Egypt; and the two angels were enemies to Sodom. Another reason for the Sodom and Egypt association is because Jerusalem is so divided between the worst of the secular progressives- the worldly- and the elect of God. In Jerusalem you have people who know absolutely nothing of the Scriptures, usually atheists, and people who know them up and down. Not only that, but worldly powers gather there and seek to prevent the spread of Jews and their settlements, much like the Pharaoh hated Jews multiplying in the land and increasing their settlements. 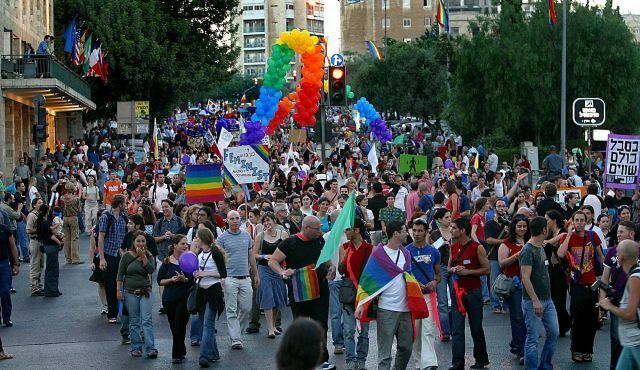 Further, the secular progressives champion homosexuality, as this has been regularly seen in their gay pride parades in Tel Aviv and spreading to Jerusalem- an evil and perverse spirit that had power in Egypt and Sodom. It may seem strange to us that the powers of the world will not allow Moses and Elijah to be buried, but this makes sense for two reasons: First, Muslims believe that the dead bodies of true prophets cannot be dishonored in death but are divinely protected. It is considered an exceptional disgrace to them if a body is not buried right away. 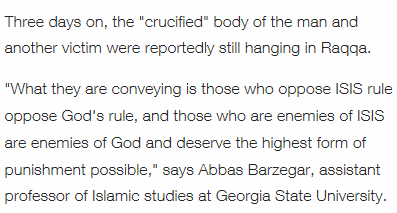 This is why Muslim mobs often toss about the cadavers of their victims in their streets when they go on one of their ecstatic rampages against Christians, Jews, or whichever nation has enraged them. The other reason for the lack of burial is probably the curiosity of human nature; they will want to know if the prophecies that tell of the two witnesses being resurrected after three and a half days are indeed true. Many of the worldly haters will know the prophecies via billions of Christians from tens of thousands of denominations. Indeed, most of the world will hate them passionately, believing that their fulfilled prophecies are merely coincidences of natural occurrences in an imperfect universe. Those who have beliefs systems that are not in-tune with Scripture will consider their prophecies the diabolical works of sorcerers or demons, or even part of a global conspiracy. Also, they probably will not be what most Christians expect from Moses and Elijah. Remember that Moses was a murderer in exile before God used him, and the people first denied him. Christ and John the Baptist were rejected. Jeremiah was rejected. David was not the king that Israel wanted. And now the renegade nations will find that their own expectations are called into question. At any rate, the unsealed world will make a holiday out of their demise, although their joy of victory will not last long. After the resurrection of the two witnesses, we find an exact opposite of those formerly sealed by the Lord because of their loyalty; we find seven thousand slain in Israel. As for the number 7,000, it is- as many readers of these articles have already guessed- a sign of the seven millenniums from which the Lord performs His work on Earth, separating the righteous and faithful from the wicked and unfaithful. Moses and Elijah will preach about this great millennial week, and the Lord will confirm their testimony. As for 1/10th of Jerusalem falling, it is a sacrificial sign- a Tithe that they have robbed from God. Fractions were given in the offerings of the Old Covenant sacrifices, and the fractions confessed the great sacrifices of God in the world, and to the millenniums in which His works cover. For example: 1/10th of grain ephah, 1/4th of an oil hin, and 1/4th of a wine hin were commanded by God to be offered with lamb sacrifices. By now, many of you already discern why those fractions were offered. The Lamb of God came on the 4th millennial day from Adam and 10th millennial day from the beginning of the mystery of Genesis (1/4, 1/10). 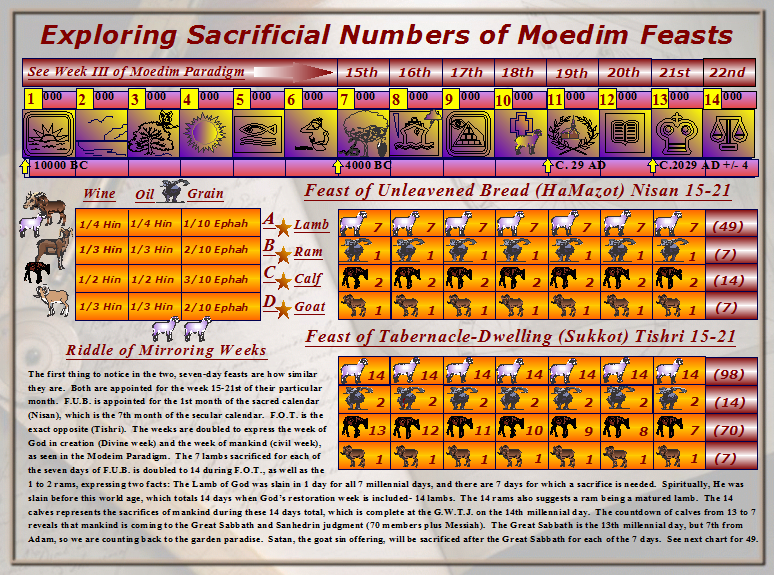 From this we are able to conclude that 1/10th of the rebellious city will fall because they will not honor the bread of the Word or the wine of the Spirit, nor have part in the sacrifice of the Lamb of God (see Moedim Paradigm below). Therefore, the Lord YHVH will require His part from them, a tithe of their works. And when the Suffering Servant Messiah is revealed, they will indeed mourn for having rejected the Truth for their religious pride and foolish ideologies. Moses and Elijah being raised in the flesh to heaven after 3.5 years of prophesying, after being dead for 3.5 days, also serves as a sign. Readers of the Book of Revelation and the Book of Daniel have seen 3.5 years shown in various ways (e.g., as days, months, years, and times). Not only does the resurrection of the two witnesses verify to the watching world that God can and will resurrect the dead martyrs of the Apocalypse, and by God’s will they are surrounded by a cloud of witnesses and brought to the Kingdom of Heaven; it shows signs of the times. The 3.5 five days before the two witnesses are resurrected and the 3.5 years of the Apocalypse, before the dead martyrs are raised at the last trumpet, confess to the spiritual resurrection and renewal of all of Israel. 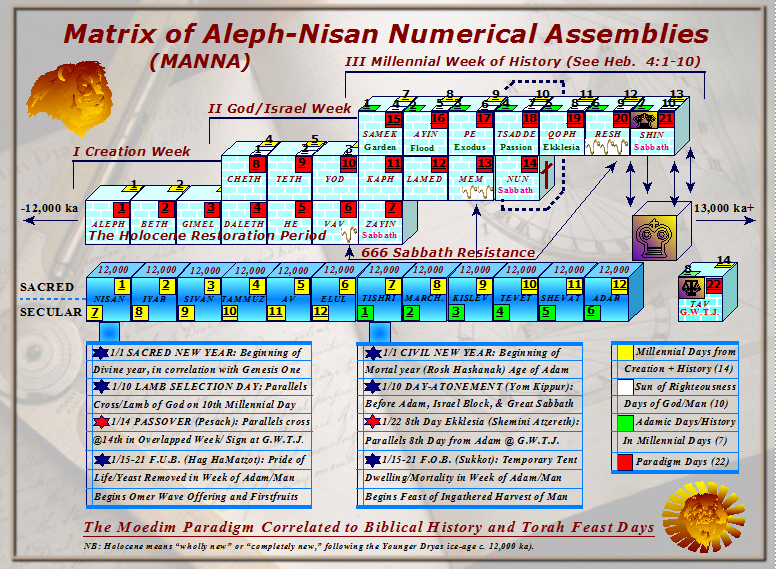 Halfway through the millennial week (7,000 years), or 3.5 millennial days from Adam, the Lord called His people out of Babylon to restore the Temple and Jerusalem. The wages of their iniquities had been paid, and the Lord raised them back up, resurrecting them as a nation. Further, if we subtract 3.5 millennial days from the time of the Apocalypse, we arrive at the time in which the Lord delivered the Hebrews via the plagues He sent on Egypt, drawing the people through the wilderness to the Promised Land. So the ripples of 3.5 have to do with past national redemptions and restorations of the nation of Israel. Yet the redemption to come under the Great King is greater than the ones that merely foreshadow and warn of the coming Kingdom of God. Remember what happened at Jericho, which Jewish tradition teaches represents the world: After the seventh time of circling the city and blowing the trumpets, they shouted, and the Lord YHVH gave them inheritance in the Kingdom of God. The wall came crashing down, and the city was torched with the inhabitants slain within. The world, likewise, awaits a seventh trumpet on the morning of the seventh millennial day. This appears cruel, yet the city was torturous and evil. Children were butchered for the appeasement of their gods, and their bones were mixed with mortar of the walls to strengthen them. The Lord could have allowed the city to go on performing their dark and abominable practices, growing beyond their walls to spread their depths of darkness to surrounding nations. Or, He could end their sickness quickly and leave them neither root nor branch to spring back. And in slaying them, He replaced them with a better nation of holy statutes and judgments- the people of Israel. When the 7th angel sound, the mystery is revealed. The martyrs are raised. The Messiah is revealed in the skies over the Battle of Armageddon, and the nations gathered against His people are consumed by fire. Then the Lord will rule the world with a guiding rod of iron and the staff of righteousness. Israel will be purged of unrepentant Muslims and progressives. And every nation that refuses and will not serve the Kingdom of Heaven will suffer for their rebellion against the Maker and the holy ones. Mount Zion will be raised to the clouds, and the faithful people of God will be transformed at the last trumpet (see 1 Cor. 15:52) and meet the Lord Messiah and the resurrected martyrs in the air. In conclusion, it is written that all of creation awaits “the revelation of the children of God,” and they shall live and reign with Christ Jesus, our Yeshua and King, for a millennium of a better day in the Sabbath Day of our GOD.